Singh points out that many versions of term exist and interpretations are highly uneven. For certain, the word’s roots come to mean a certain proponent of liberation or freedom. Nast may have agreed with John Locke, who Singh reminds us, envisioned liberalism as a state where individuals enjoy a “natural liberty” and enter into a “social contract” in order to establish a government where life, liberty, and property can be secured (Singh). Nast historian Morton Keller describes Nast’s Radical Republicanism as more than simply a party affiliation. “It rested on a set of social values that induced him to comment on a wide range of American public issues” (105). Abolition and civil rights for African Americans, particularly the right to vote, Keller says, represented the “touchstone” of Radical Republicanism. Even after the war, when Negrohobia “prevailed” Radical Republicans believed in a nation of equality. But the rights of African Americans were a priority. “Nast’s sensitivity to the rights of minority Americans extended to others besides embattled freedmen,” (Keller 107). His vision of America included all minorities – in public schools – at the voting booth and allegorically, at the Thanksgiving table. “The Chinese and the Indians in particular came under his protective wing” (107). After the Civil War, the preeminent Radial Republican leaders in the nation were Thaddeus Stevens and Charles Sumner (Foner 229). With ideals originating in New England constituencies, the movement was strong in both small towns and family farms – where free labor was self-evident (Foner 228). Radical ideology embraced the utopian vision of a nation whose “citizens enjoyed equality of civil and political rights, secured by a powerful and beneficent national state” (Foner 230). Examples of Nast’s Radical Republicanism and utopian beliefs are best expressed in his work of the 1860s: “Uncle Sam’s Thanksgiving Dinner,” “Emancipation of Negroes” and many of Nast’s commentary on the New York Public School System. After Lincoln’s death, Radical Republicans placed considerable hope in Andrew Johnson and the promise of northern-led reform. Johnson did not live up to these expectations. Increasingly, Johnson unveiled “an emerging image of the white South’s champion (Foner 190). Radical Republicans felt disillusioned with the Johnson administration and with the president as an individual leader. This reality bitterly disappointed Radical Republicans and especially Nast, who took his angst out in the form of satire and caricature. With Johnson as his subject, Nast embarked on a new phase of his artistic career – personal political cartoon satire. Nast’ most recent biographer (2012) Fiona Deans Halloran attributes Nast’s German origins and the German community in New York as key in shaping the young artist’s liberal philosophy. Germans in New York especially focused on local political corruption and the national struggle over slavery” (29). As German Forty-Eighters, the community in New York City keenly followed the social movements in Europe. “The fundamental principle of Liberalism was the idea that human history was a story of progress” (29). Which the same I would rise to explain. As I frequent remarked to Bill Nye. And me in a way I despise. With the smile that was childlike and bland. And the same with intent to deceive. Which the same Nye had dealt unto me. And said, “Can this be? And he went for that heathen Chinee. Yet I state but the facts. What is frequent in tapers,–that’s wax. Which the same I am free to maintain. This cartoon, published on July 16, 1870, is one of the more curious of Nast’s Chinese pieces. The cartoon addresses the issue of using Chinese labor as an efficient, lower cost alternative, thus blurring the definition of contract, or forced slave labor known as “coolie” labor. For a nation still coming to terms with the issue of slavery and slave labor, “coolie” labor was viewed as suspect, and a threat to replace free white labor for the betterment of capitalist or business interests. For another perspective click here. Two Chinese workers stand behind a shoe cobbler. They carry sabers marked “Cheap Labor” on the blades. The cobbler is St. Crispin, the patron saint of leather workers. The cobbler’s hair is styled in a tonsure and a halo hovers over his head. Whether intentional or not, the cobbler bears a strong resemblance to Nast’s hero, Abraham Lincoln. He concentrates on his work and appears to be unaware of his Chinese visitors lurking behind with their swords raised. A violent attack is imminent. The Chinese man at the far left has an abnormally elongated face and slanted eyes that upturn at an unnatural angle. He clenches two weapons, but he has yet to lunge toward St. Crispin. At center and directly behind the cobbler is another Chinese man. His facial features are more normal and do not appear exaggerated. His look is intent on what he is about to do. With a two-handed grip, he hurls his “Cheap Labor” blade high over his head, ready to strike the first blow upon cobbler oblivious to the danger. Nast identifies this as a “New Issue – The Chinese – American Question” and that question is how to reconcile the Chinese into the labor force. The next issue of Harper’s Weekly reported on an uprising that may have been breaking at the time Nast executed his drawing. In that issue, Harper’s Weekly reported on Mr. Sampson, owner of a New England shoe factory. Experiencing financial difficulties, Sampson sought wage concessions from his factory’s labor force. They agreed to consider his request provided Sampson open his books to make sure the owner had done all he could and operated his business above board. Sampson refused this request and instead arranged to recruit Chinese workers from San Francisco. The article makes an explicit distinction that Sampson recruited Chinese workers already in the U.S., unlike that of an individual by the distinctive name of Mr. Koopmanschoop, a labor broker, and capitalist who dealt directly with China for his labor force. The article infers that the methods to import Chinese labor from China were nothing more than disguised slavery. Coolie labor became a subject of everyday discussion and concern, but Harper’s argues, Mr. Sampson was well within his rights to seek out cheaper labor to save his business. The Harper’s Weekly article takes a favorable view of the Chinese workers. “Since their arrival…their deportment has been excellent, and the prejudice at first existing against them is said to be gradually giving away” (Harper’s Weekly, 23 July 1870). The article included two large illustrations, not drawn by Nast, showing where the factory was situated, and an interior scene of Chinese men working inside the factory without incident. The scene was clean, peaceful and unremarkable. Presumably, as news of Chinese workers entering American factories in New England reached New Yorkers, Nast quickly created this small cartoon, placed near the back of the issue in the advertisement section. Cartoons of this size, roughly 5 inches by 5 inches, were typically nestled near the advertisements. This section of the magazine may have been blocked out, ready to receive a quick image for breaking news. This would explain why there is no article in the paper about Chinese shoemakers that week, but appeared in the next issue. The pro-capitalist position of Harper’s Weekly does not describe the Chinese as strike breakers, but according to John Kuo Wei Tchen, this maneuver in Massachusetts and a similar one in New Jersey was a deliberate attempt to break a strike of the shoe labor union known as the Knights of St. Crispin. “The Crispins were one of the largest trade unions in the country, claiming some forty thousand members in Massachusetts alone.” Using Chinese labor in such a manner made national news, and reinforced the perception of the Chinese as cheap, possibly indentured or forced labor. Willingly or not, by undercutting the price of white labor, and working to the satisfaction of employers, the manipulation of Chinese labor played a crucial role in how their racial identities were formed within a Euro-centric America (Tchen 175-176). As a Radical Republican, Nast believed in the capitalist point of view that saw a benefit by adding Chinese labor to any given industry. Yet, Nast drew an unflattering portrait of Chinese labor with this cartoon. As John Kuo Wei Tchen notes, “Chinese cheap labor” had become a “war cry” and that was reflected in cartoons and in contemporary poetry, such as Bret Harte’s “Plain Language from Truthful James.” The poem depicts a Chinese character, Ah Sin, as a cunning heathen. 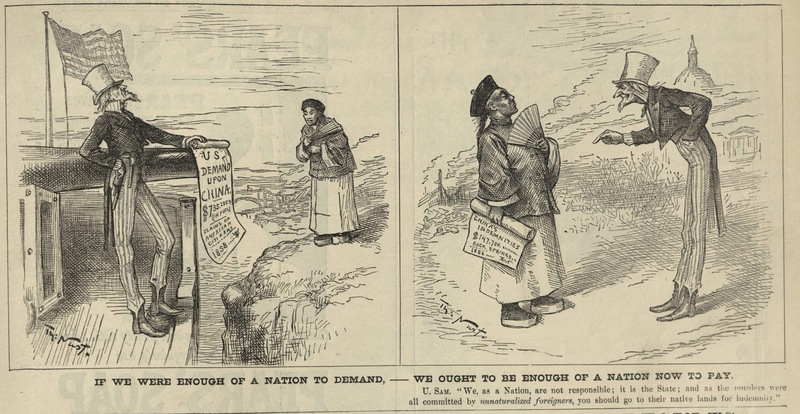 Nast would revive Ah Sin nine years later, but this 1870 cartoon reflects the idea infused in the poem that allowing the Chinese to have “unfettered entry” into America was dangerous (Tchen 196). Nast would also play on the poem’s title with his pro-Chinese cartoon “Blaine Language” one of many cartoons which criticized U.S. Senator James G. Blaine for his anti-Chinese positions. Whether Nast believed in the danger or merely reflected what was discussed on the street—as a topic for conversation— is unknown. The cartoon is inconsistent with the majority of his Chinese cartoons. The figures, however, closely resemble the Chinese men who taunt Denis Kearney in Nast’s 1880 cartoon, Ides of March. Historian John Kuo Wei Tchen speculates that Nast likely did not have any real knowledge or exposure to the Chinese in New York, and adds that his cartoons “indicate familiarity with the representational conventions of Chinese in literature and on stage, but not much other knowledge” (211). Tchen’s assessment makes sense. The question remains, does that excuse Nast from drawing images like this – or was characterizations like this one purposeful because Nast was simply incorporating the popular view? 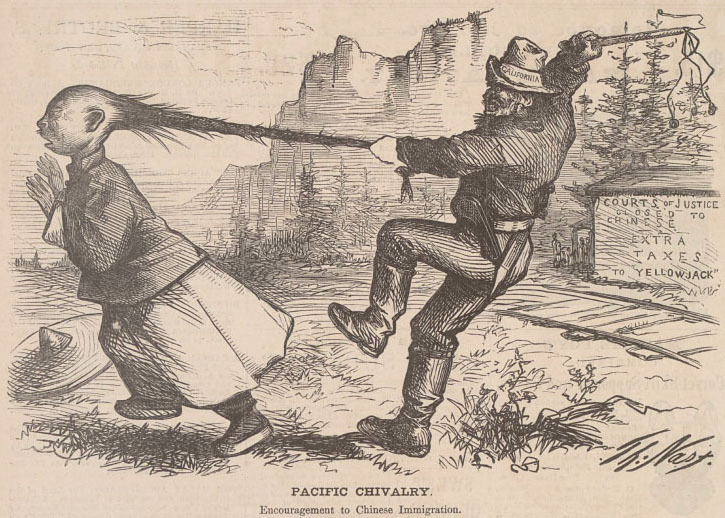 This is Nast’s first cartoon of a Chinese immigrant or sojourner in the West Coast. The cartoon establishes Nast’s sympathies toward the Chinese. Pacific Chivalry sets the western locale and places a central focus on the unique hairstyle or “queue” of Chinese men. During the Manchurian takeover of the Ming Dynasty, it was decreed that Chinese men shave their heads with the exception of a part of the back of the head where a long ponytail, often braided, would remain. In times of battle, the “queue” helped to distinguish Manchu warriors from the enemy. Chinese men faced execution if they did not grow a queue (Spence 38). In the United States, the queue was a subject of fascination that added to the mystique and perceived feminization of Chinese men who were often “depicted as lacking virility.” In the male-dominated world of western gold mining “Chinese men became targets of white men’s fears of homosexuality or the objects of their desire” (Pfaelzer 13). Unknown terror awaits this Chinese figure as he attempts to flee from a white aggressor. Wearing a hat that bears the name California, the white laborer bears his teeth in a determined grimace. In his right hand, he raises a whip – a variation of a cat-o-nine whip, believed to have originated to punish African slaves during the U.S. slave trade. He has lifted his left leg to counterbalance his swing and prepares to strike his Chinese victim. His left hand grips the Chinese queue and prevents the Chinese from escape. The force of pulling on the hair elongates the Chinese man’s head. Shapes of skulls were thought to be indicative of intelligence and placement in an evolutionary hierarchy by stretching out the skull of a Chinese man, the perpetrator, and perhaps the artist offers the Chinese different than the standard perception for human normality. Though he is not drawn as overtly Irish, the working man fits the look that Nast establishes for white labor – gruff, bearded, burly and dominating. 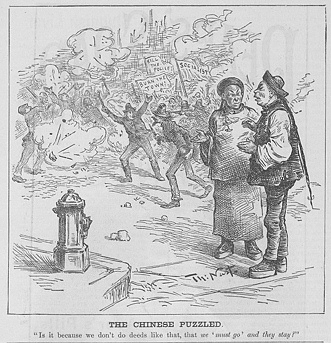 The look was repeated in The Chinese Question, 18 February 1871. and other cartoons. It should be noted that the Knights of Labor, an organization formed for white labor interests in western states and territories, and often the instigating agent for violence against the Chinese, did have a large Irish Catholic membership. (See Here’s a Pretty Mess). The Chinese man is startled by his capture. His fearful expression further distorted by the pulling from the back of his scalp. His sun hat, the douli, has fallen to the ground and his hands are open in a defensive posture, though the threat has come from behind. Nast, of course, is mocking California’s definition of justice and the battery of local laws passed by the new state to scare, threaten and restrict Chinese and opportunities in the gold mines, in society and in business. Nast draws a contrast from Pacific form of “chivalry” compared to from the respectful way Columbia introduces the Chinese to American society. What fate awaits this Chinese man is up to the reader to decide. Will he be beaten, robbed, driven out of the mining camp, out of town, or sexually abused is not known. With this image, Nast clearly asserts something terrible will occur. “Nast condemned this treatment as an affront to the values of an open society” (Keller 108). Wood Cut. A form of relief engraving, where the parts of the image that are white or uncolored are carved away from the wood. An image is drawn directly onto a section of wood or on paper that is then transferred to a section of wood and carving is done parallel to the grain. If one thinks of a tree – it is cut lengthwise to form long planks. This would be the type of lumber used for a wood cut. Because of the direction of the grain, wood cuts did not hold up to modern printing presses and wood cuts could not be combined with metal or movable type in modern printing. Harper’s Weekly did not use wood cuts. Wood Engraving: A relief printing process, like wood cuts. however wood engravings were carved from the cross-cut section of a hard wood tree trunk(boxwood was preferred). By carving on the end of the grain, the engraver enjoyed much more flexibility with tools and could exact very fine lines. By being perpendicular to the grain, cutting the wood in this manner, allowed the block to be inserted into the metal and movable types of the era. The compatibility of engraving and type made wood engraving the established printing process for nearly half a century. This was the image reproduction process used by Harper’s Weekly and the method by which Thomas Nast learned his trade. See a video demonstration of wood engraving here. The process is based on the principle that grease and water do not mix. To create a lithograph, the stone or plate is washed with water –which is repelled by the crayon– and then with ink –which is absorbed by the crayon. The image is printed onto the paper from the stone or plate, which can be re-inked many times without wear. A chromolithograph is a colored lithograph, with at least three colors, in which each color is printed from a separate stone and where the image is composed from those colors. A tinted lithograph is a lithograph whose image is printed from one stone and which has wash color for tinting applied from one or two other stones. Lithography is a planographic process and so no platemark is created when a lithograph is printed. Lithography was invented by Alois Senefelder in 1798 but didn’t come into general use until the 1820s. After that time lithography quickly replaced intaglio processes for most illustrative and commercial applications, for the design was easier to apply to the stone or plate, it was much easier to rework or correct a design, and many more images could be produced without loss of quality than in any of the intaglio processes. Lithographs and Chromolithographs were used to print the cartoons and colored cartoons for The San Francisco Illustrated Wasp, and its artist George F. Keller. Their experience with this form of printmaking originated from making cigar box labels. For an excellent series on the history of printmaking, which includes details and examples of all these processes, I highly recommend viewing Richard Benson’s excellent videos for the MOMA. The videos are available in abbreviated segments (highlights), following the progressive history of printmaking, or you may view the eight-hour comprehensive look (which is broken up into segments for more defined viewing). The technique of Thomas Nast is explained at the 17-minute mark. 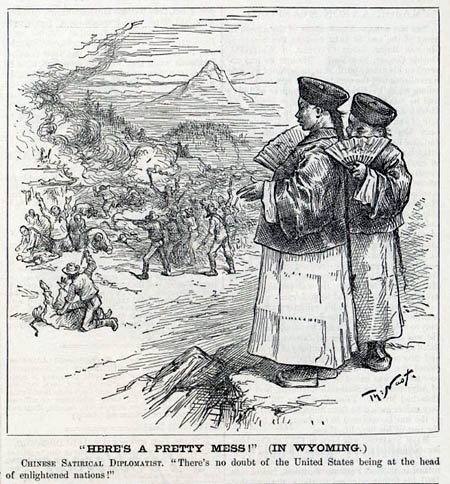 One of Thomas Nast’s last cartoons featuring the Chinese was published in the fall of 1885 as a reaction to the Rocks Springs Massacre of Chinese miners, “one of the most violent racial episodes in the history of the West” (Pfaelzer 209). Harper’s Weekly addressed the massacre in two separate issues, each with an illustration and unsigned editorial commentary (likely by George W. Curtis). While Nast contributed full-sized images on other topics, his sole cartoon on the massacre was a quarter-page-sized image near the back of the issue. The cartoon lacks the passion and sophistication one would expect from Nast in reaction to the largest racial attack in U.S. history. Perhaps the cartoon was hastily drawn as events became known. The image may have replaced another cartoon slated for the spot – the advertising section always blocked out the area for one or two small cartoons. Two Chinese diplomats stand upon higher ground and overlook a scene of mayhem below. They witness the Rock Creek massacre in progress. An assortment of white laborers are pummeling Chinese laborers whom Nast identifies with long hair queue. The primary Chinese figures are styled in the same manner as the “John Confucius/John Chinaman” diplomat, however, one holds a fan in front of his face. One diplomat stands in profile and faces the massacre directly, the other crouches behind his colleague and appears to whisper in his ear. The fan emphasizes the secret nature of their conversation. The detail of the cartoon is centered on the Chinese men, and not on the violence below, which is more crudely drawn. Of all Nast’s images of the Chinese, this depiction, particularly of the Chinese man in profile, are strongly feminized. With some minor costume details, these men could be women. This is an unusual tact for Nast to adopt. At first glance, the contrast is quite clear. Who are these white people calling the Chinese heathens, barbarians and a race unfit for American citizenship? Look at how Americans behave! This is quite a spectacle of enlightened behavior. On this score, the cartoon is successful. With a deeper look, the viewer may realize that these Chinese diplomats do nothing but observe the melee. They watch as their countrymen are murdered and driven out. The Chinese are denied the right to earn an honest living – a living they were recruited for by American business and invited to participate in. One might interpret the Chinese men are gleeful for this opportunity to make a cultural comparison between East and West. Does Nast suggest the massacre serves a higher purpose – an occasion upon which the diplomats can prove their superiority? If so, they make their point at the expense of their countrymen. Still, Nast portrays the two men as inactive. Shock is absent. They feel no outrage by what they witness. Neither is Nast. Nast chose the cartoon to be sardonic and sarcastic – and on one level, he succeeds in showing his viewers who the real barbarians are. But Nast could have made his point and at the same time, infuse his Chinese observers with a sense of sorrow or anger. Why did Nast not weigh in on the moral argument, as he had done many times before, by simply adding Columbia to the scene? By standing alongside her Chinese guests, shedding tears, Columbia her fist raised in defiance, the maternal icon of American morality might elicit sympathy from the viewers. Nast followers knew what Columbia meant in his cartoons. Nast chose not to take her to Wyoming. He did not employ her as a moral agent. Columbia’s values and message are absent in this composition. Nast also refused to demonize or detail reports of a predominately Irish-labor mob as the perpetrators of the massacre. While his drawing depicts white upon Chinese violence, Nast chose not to exploit the Irish nature of the mob. Nast’s infamous Irish ape is not present as instigators at this scene. In reality, response to the massacre by the Chinese government was immediate and persistent as they complained to Secretary of State Thomas Bayard, and argued for prosecution of the murderers and reparations (Pfaelzer 211-214). The massacre of the Chinese laborers in Wyoming is one of the crimes which disgrace a people, because it is due to the jealousy and hatred of a race. In excluding the Chinese from the country by law we have especially stigmatized them, and common decency and humanity should lead us to protect those of them who unfortunately happen to be among us, and whom the law shows that we wish were somewhere else. Perhaps Nast’s state of mind had grown tired of an issue on which he and the progressive Republican base had repeatedly experienced defeat. As Morton Keller has surmised, Nast’s passions were linked to the utopian principles of the Radical Republicanism he championed. “When that spirit faded, so did the force and fire of Nast’s art” (Keller viii). In the next issue Harper’s Weekly published a full-page engraving based on a photograph taken at the scene of the massacre. Nast had no part in the illustration. 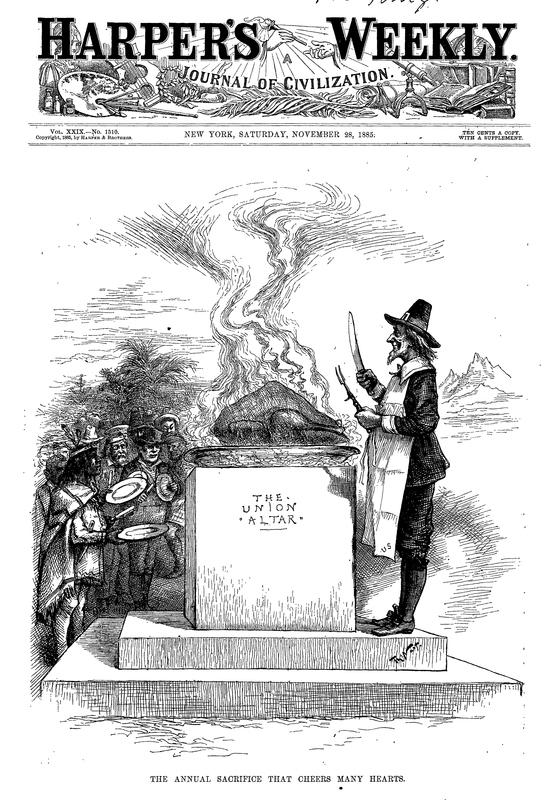 Nast contributed a full-paged cartoon in the same issue, but it did not address the massacre. Commentary on the massacre was left to others. Nast’s career at Harper’s Weekly was coming to a close. In 1862, the United States Congress authorized an act to construct railroad and telegraph lines connecting East and West. The Central Pacific Rail Road (CPRR) was in charge of construction from Sacramento, California to the East. In order to fulfill the enormous labor demands and meet financial incentives offered by the federal government, Chinese labor was recruited. The principals of the CPPR were known as the “Big Four” Leland Stanford, president; C.P. Huntington, vice president; Mark Hopkins, treasurer and Charles Crocker, engineer (Storti 10). Despite early reluctance from his partners, Crocker recruited thousands of Chinese as railroad laborers, and due to their experience as miners, hired them as coal miners to support the fuel needed for the rail effort. “Crocker brought them in by the trainload” and by 1868, the Chinese “made up 80 percent of the Central Pacific’s work force.” Crocker happily called them “the best road builders in the world.” They were known derisively as “Crocker’s pets” (Storti 12). Rock Springs was located along Bitter Creek tributary and in an area rich with coal. The path of the Union Pacific Railroad was slated to go right through the coal-rich area. Coal was “a discovery of almost incalculable value to the company” (Storti 34). On the surface, the land, which the Indians had negotiated away seemed inarable and desolate – the poorest tract of land in Wyoming. What lay underneath the soil made it valuable. Rudimentary mining towns quickly sprang up in the area and by 1871 Rock Springs had become central headquarters to the Wyoming Coal and Mining Company (Storti 54). The year 1873 began a sustained era of severe economic depression which affected the railroad, and other supporting industries including coal mining towns like Rock Creek. 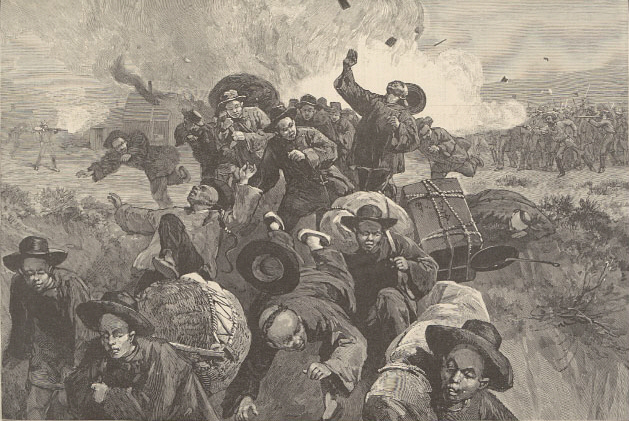 In 1875, 150 Chinese workers reported for duty as strikebreakers, under the protection of U.S. troops (Storti 71). Coal mining was “astonishingly dangerous work.” Storti’s book on the Rock Creek massacre provides valuable insight into the details and dangers of the coal miner’s (or colliers as they were known) exhaustive toils. Storti describes it as a “tightly knit brotherhood” of men who risked their lives – rarely saw daylight or breathed in clean air. They were protective of each other and of their wages. They knew the risks they undertook and expected to be paid well for that sacrifice. Nevertheless, Storti explains, labor management wanted profits to increase and did not think twice about humiliating their labor force. When Chinese miners arrived, they “were routinely given the most productive rooms and were always allowed first choice of rooms when a new entry was opened” (Storti 83). The Chinese were not above flaunting their privileged position, deepening further resentment and competition. As in other locations where the Chinese gathered to work, a supporting society was quickly established. A Chinatown near Rock Springs flourished. With the help of Chinese labor, the Rock Springs mining camp tripled its coal production from 104,000 tons in 1875 to 302,000 tons in 1884. In the fall of 1884 threats of strikes across the region were instigated by invigorated union interests and new pro-labor affiliations, such as the Knights of Labor. Rock Springs avoided these threats and colliers from Rock Springs did not partake in Knights of Labor meetings. But by the summer of 1885, Chinese -White labor tensions reached a breaking point regarding the continued preferential treatment of Chinese workers, with the Chinese gaining the most concessions. When disputes arose, the Chinese stood their ground and offered no concessions. The confrontations, which took place deep inside the mines, came to blows. Word of the fights made their way to the surface as white laborers began to collect in the streets, “shouting anti-Chinese slogans” (Storti 108-113). In the 1880s, the Knights of Labor stood as the most powerful labor union in the nation (Storti 103). The Knights of Labor were strong proponents of the Chinese Exclusion Act and their membership was predominately Catholic (Catholic University of America). The Knights of Labor organized 1886 events that led to the Chicago Haymarket demonstration and massacre, though violence was never planned and did not directly involve Chinese laborers. The white miners had asked the Chinese to join them in a strike. Unwilling to strike, violence erupted. “A force of about 150 Irish-born miners marched to Chinatown armed with shotguns” (Pfaelzer 210). The mob first fired into the air, demanding that the Chinese leave. As they began to do so, Chinese were shot at directly. Several homes and businesses in Chinatown were burned to the ground. An estimated 400 to 500 Chinese were forcibly driven out, many escaped to the outskirts of town without food, water or shelter where “about 50 died of exposure and starvation as they tried to reach the Green River and escape from the mine” (Pfaelzer 211). The final death toll was put at fifty-one, the highest ever for a race riot in American history” (Storti 142). Nast drew this full-page cartoon at the height of his attacks on Tweed. 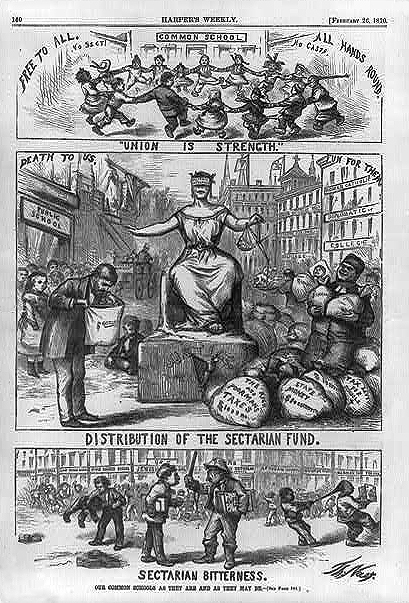 Nast took exception to the Democratic politician’s granting of public funds to the New York Roman Catholic Church for the establishment of sectarian schools. Nast strongly believed in the newly formed public school system and saw the institution as a utopian organ of education – a place where all religions, creeds, cultures, ethnicities and races could attend. While not a Chinese cartoon per se, at the top and bottom panels, a Chinese child experiences differing educational possibilities and potential treatment that depend on whether or not public or sectarian schools are allowed to prevail. With the establishment of special treatment for Catholic schools, Nast predicts a domino effect that will result in mayhem and violence among New York City schoolchildren. While this website does not focus on Nast and the public school issue (See Benjamin Justice’s fine article Thomas Nast and the Public School of the 1870s.) It would be negligent not to mention Lady Justice, a relative or incarnation of Columbia, who Nast draws for the first and only time as an Irish woman. Lady Justice may be blindfolded, but she has been bought off by the Irish Catholics, tipping the scales toward the source of the money – and in Nast’s opinion, the corruption. The Protestant side is shown defeated as “Death to Us” hovers over a dejected public school system. Their buildings crumble. Roman Catholics however are elated and exclaim “Fun For Us.” They enjoy the fruits of their influence on the education system and the fine institutions built with taxpayer money. The division of public funds is lopsided. In the third panel, Nast presents the repercussions of a special school for each ethnicity or race, the consequences that began with Irish-Catholic special interests. Each building in the background brands its own school identity. Everyone places claim on their differences and these differences result in competition and bitterness. The play area is a battleground. Children do not hold hands. Chinese queues do not spin in merriment. The queue, once again has become a tool for oppression – a handle upon which to grip, restrain and torment. In this scene, Nast shows another victim of oppression becoming the aggressor. An African American child has gripped the queue in his hands and prevents the Chinese child from heading toward his school. The Wasp’s first anti-Chinese cartoon, The Equal of Persons Gibson and Loomis, appeared on November 18, 1877, six months after the paper opened for business. It was a “caustic response” to Reverends Gibson and Loomis who offered positive testimony to the “good character” of the Chinese immigrant in April 1876 before the Committee of the Senate of the State of California. The committee was a legislative body that held hearings on the social, moral and political effect of Chinese immigration (West 128: Internet Archive). They were part of a San Francisco press that “lambasted pro-immigration ministers as hypocrites” (Paddison 527). The month-long hearing’s purpose debated the effects of Chinese immigration and sought to determine if the Chinese “advanced or hindered “Christian civilization.”” Most of the testimony was stacked against the Chinese. Foregone conclusions were accepted as fact. The Rev. Otis Gibson, along with Presbyterian Augustus W. Loomis and a few other Protestant ministers testified on behalf of the Chinese asserting that the Chinese “would pose no danger.” The reverends staunchly believed that the anti-Chinese agitation in the community was stoked not by race, but by religion and blamed Irish Catholics  as the active agents in the unrest (Paddison 524). The Reverend Otis Gibson, in particular, was well known as San Francisco’s “most outspoken white defender of the Chinese” (Paddison 522). Keller’s four-part drawing confronts the witnesses’ pro-Chinese testimony with images of Chinese engaged in unseemly activities. 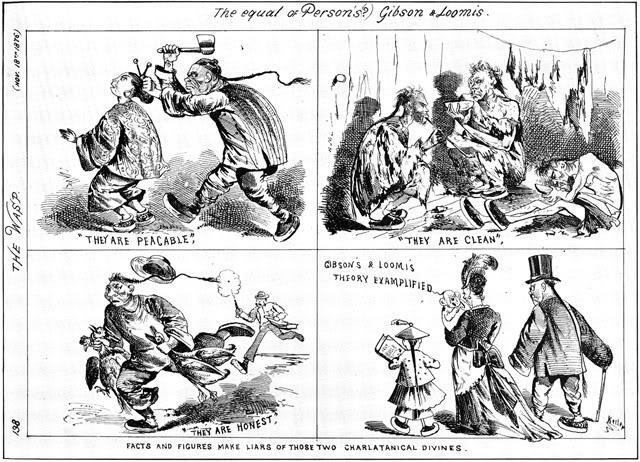 In the top left panel, Keller includes a Chinese male with an ax who chases after a female – a scene of violence to counter the assertion that “they are peaceful.” Top right, three malnourished Chinese men dine in squalid, decrepit living conditions – an exception to the statement “they are clean.” Bottom left, to disavow the claim “they are honest” a Chinese man flees with two birds he has stolen. A gun-toting white man is in pursuit. In the bottom right panel, The Wasp lampoons the Chinese immigrant’s attempt to assimilate as ridiculous, and attempts to “raise the specter of miscegenation.” The panel shows “white woman with a Chinese husband and Chinese children” (Paddison 528). Keller refers to Reverends Gibson and Loomis in his captions as “charlatanical [sic] divines” (West 129). There are contradictions in the image, however. The male chasing the woman is not dressed in the same dirty, tattered clothing seen at top right. The three gaunt men eat from bowls while rodents scamper on the floor, presumably their next meal, but the immigrant thief shown bottom left is stealing chickens. Why pilfer poultry when a free, plentiful supply of rats and mice were available? This first attempt falls short in consistency compared to the anti-Chinese messages that would be finessed in later Keller images. 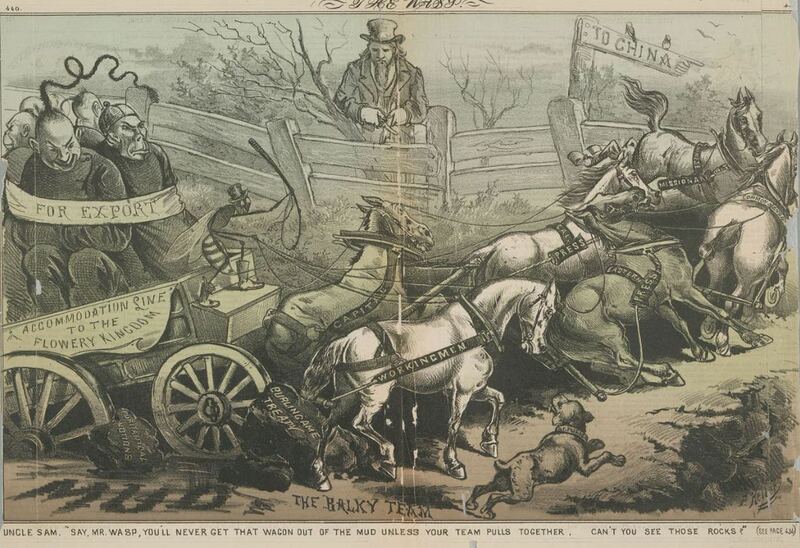 Joshua Paddison provides a thorough examination of anti-Irish Catholic tensions between Protestant nativism in San Francisco, similar to the tensions among Protestants, Republicans, and Democrats in New York City. Paddison examines early anti-Irish racism in California and how the Irish exploited the Chinese to counteract that racism – capitalizing on labor competition as a means to unite and to assert their place as white men alongside the vast majority of Christian Caucasians who wanted the Chinese driven out. 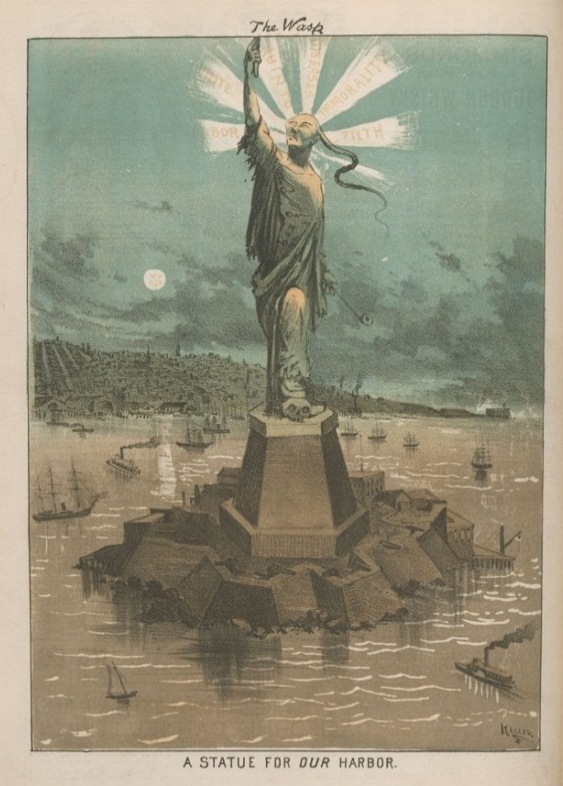 San Francisco artist George F. Keller struck again, aided by The Wasp’s increased investment in color lithography, with A Statue For Our Harbor, November 11, 1881. Although the Statue of Liberty and its base had yet to make a physical appearance in New York’s harbor, discussions about the statue and controversies in fundraising and artists’renditions, were broadly covered in East Coast media and beyond. Keller’s image serves as a reminder that he and or The Wasp kept their attention on their eastern counterparts and applied regional topics to switch focus on West Coast concerns. The image is a cry for attention to examine West Coast immigration issues. The image was preceded by a popular book, The Last Days of the Republic (1880) written by newspaper editor Pierson Dooner who “described immigration as a “vicious conspiracy” against the U.S. by the Chinese, and illustrated his point with Keller’s drawings” (Tchen/Yeats, 231). The implication is clear. Modern European immigration has acquiesced in deference to an infiltration of backward, invading forces from Asia. A full moon with a Chinese likeness sneeringly supervises the scene. His celestial light bathes the night sky. Six beams of light emanate from the statue’s unseen torch or lamp.They illuminate the harbor with “Filth,” “Immorality,” “Diseases,” and requiring three beams,“Ruin to White Labor.” In the statue’s other hand is an opium pipe. The Chinese man‘s foot is triumphantly perched upon a human skull, presumably that of a white human, and behind the skull is a rat’s tail. The rodent has picked the skull clean. The Wasp’s readers knew all too well that the Chinese ate rodents. Western press delighted in repeating the disgusting stereotype. In Keller’s illustration, the Chinese have ascended to the top of the food chain. A position that is complicit with the cannibalism of white humanity. Rodents thriving along the embankment collect at the base of the star-shaped pedestal, which is also strewn with trash. 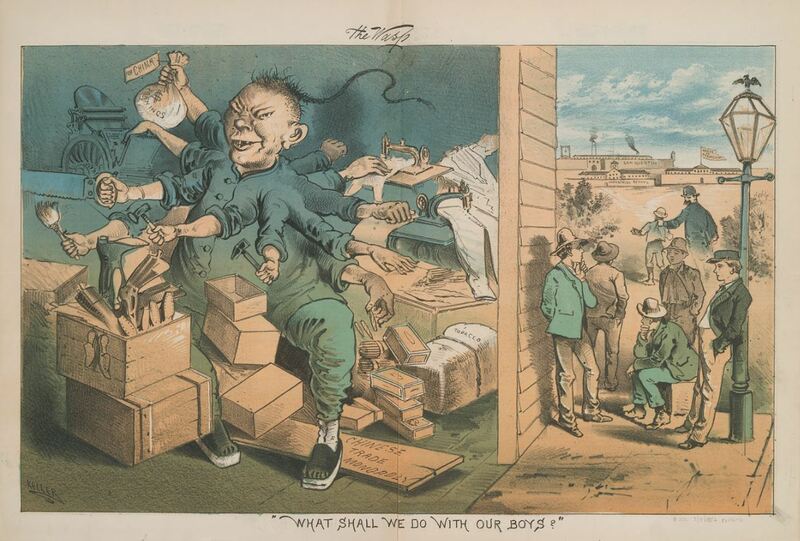 While labor issues were one of the six categories that predominated The Wasp’s view of the Chinese, the overarching theme in this image is one of disease and immorality. The Wasp suggests there can be no question that the Chinese are to blame for dark and dismal polluted condition of San Francisco’s harbor. Light and dark divides the image. As a “celestial” the Chinese figure is awash in light as he extends his arm and face toward the source of his “otherness” the celestial sky. The clouds part in his presence. The colors darken as the figure connects with the earth and his roots and foundation into his new San Francisco home. The Chinese Must Go, But Who Keeps Them? was drawn by George F. Keller and published on May 11, 1878. The cartoon is The Wasp’s interpretation of the Workingmen’s Party’s rallying cry against Chinese presence in California. Front and center is a donkey in military garb, an indication of a war- war against the Chinese, and liberal immigration policies. On the epaulets of the donkey’s uniform, the initials “D.K.” represent the faction’s self-styled military leader, Irish-born Denis Kearney and chief crier of “the Chinese Must Go” mantra. Kearney, a charismatic Irish American “began his infamous outdoor “Sandlot” meetings on vacant lots…and understood how to turn rage about unemployment, the price of food, and the huge land grants to the railroads against the Chinese” (Pfaelzer 77). The cartoon’s title question has a double meaning. Kearney and his Workingmen’s Party were clear on one goal. They wanted the Chinese out of California- out of the West Coast – out of the labor market. Go back to China, go East – as long as they went. They cared little about who would take care of the Chinese afterward. The title challenges the readers to look within. Who was taking care of the Chinese in California? Who was keeping them, enabling them, to stay in California? The Wasp pointed the finger at their readers. Surrounding the braying Kearney, six vignettes show the consequences of white citizens patronizing Chinese business; a cigar shop, shoe cobbler, laundry, horse livery and meat butcher. All professions that the Chinese successfully established and sustained through white patronage. White dollars kept the Chinese in place. By asking, “But who keeps them?” the cartoon places the blame directly upon white households. The editorial called for widespread boycotts of Chinese goods and services. White woman in California were reluctant to give up the freedoms they had enjoyed by subbing out the domestic work to Chinese businesses. “Their freedom to travel east, to visit friends and family, and their time for church and artistic clubs – all the result of inexpensive Chinese servants – was in jeopardy” (Pfaelzer 66). As the 1873 economic collapse persisted well into 1876, anti-Chinese zealotry organized into groups, such as the Supreme Order of the Caucasians, who vowed to “annihilate” white people who did not follow their “hit list” of boycotts (Pfaelzer 67). However, the image is not entirely flattering to Irish-born Kearney and his followers. According to Richard Samuel West, The Wasp abhorred mob violence and the paper adopted the editorial position that while it believed in the true threat of Chinese labor at the expense of white labor, Kearney’s method lacked dignity. 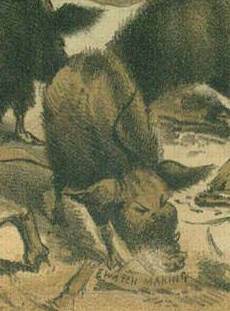 Unlike Nast who drew Kearney’s realistically, The Wasp rarely used Kearney’s face in their magazines and in this particular instance, preferred to use the Democratic donkey in his place. “The animal appealed to illustrators for its jackass connotations” (Dewey 17). Nevertheless, Kearney’s Sandlot speeches resonated with California Democrats and the working class who comprised Kearney’s Workingmen’s Party. “Just two years later, the new party managed to rewrite local anti-Chinese codes into the second California constitution” (Pfaelzer 78-79). Other anti-Chinese measures would follow in California, and loomed on the federal horizon. Back east, Thomas Nast took notice as he watched the Democratic Party gain influence over the electorate and contribute to the shifting public policy against the Chinese. To Nast’s horror, Republicans came under the influence, as well. Nast drew numerous cartoons sympathetic to the Chinese’s plight in America. Many of his cartoons react to unfolding events in California. Nast included many references to Kearney in his cartoons, often sarcastically quoting him on wall posters. See example: Every Dog (No Distinction of Color) Has His Day, February 8, 1879. It should be noted that Keller’s donkey wears a bicorn military hat. A few of Nast’s anti-Chinese cartoon figures contain a military figure wearing a bicorn hat. This may or may not serve as a symbol for Kearney. In the context of Nast’s cartoons, the suggestion seems plausible. One distinctive feature of The Wasp was its use of color lithography. Korbel’s and Keller’s experience and expertise in color lithographs of cigar box labels and Korbel’s investment in its own printing equipment gave The Wasp instant appeal. An example of effective use of color can be found in What Shall We Do With Our Boys, March 3, 1882. 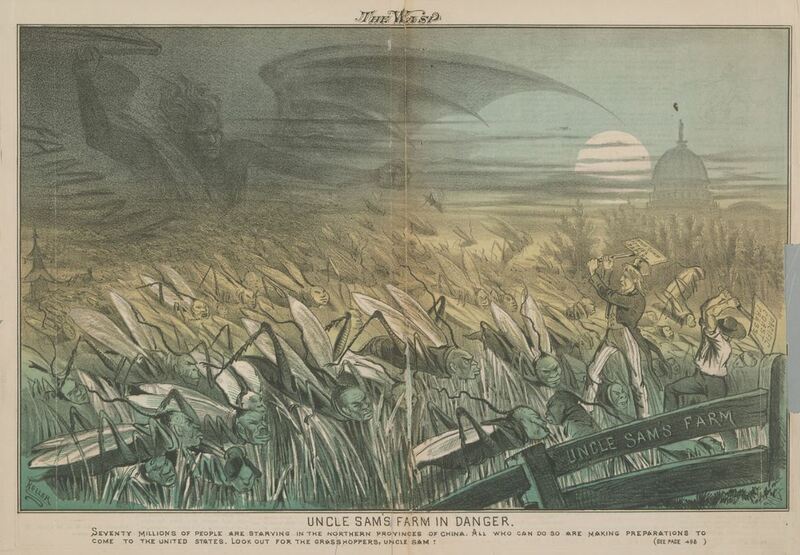 Clearly fixated on the labor issue the cartoon incorporates two of West’ six themes favored by The Wasp: the Chinese as ruthless competitors and subversive labor monsters. The frame is divided, two-thirds occupied and dominated by an eleven-handed Chinese worker-monster. “The Chinese were depicted as “many handed” or monstrous creatures depriving white labors of their jobs” (Choy 84). Keller’s uber-octopus like Chinese laborer is seen going to town, a busy industrial whirlwind of labor productivity. He is unstoppable in the trades and crafts most attributed to Chinese workers; shoemaker, tailor, cigar maker and laundryman testifies his industriousness. Collectively, his array of hands holds a saw, mallet, hammer, and brush. Most dangerous of all, he is succeeding. Two hands are busy socking away a substantial bag of money and assures the satchel is carted off in a rickshaw to export “For China.” “Chinese Trade Monopoly” is secured in place with his foot. The image emphasizes the prevailing anti-Chinese view that the Chinese aren’t like other immigrants. They are instead “sojourners” whose only wish is to make money in America to send back to their families in China. The cartoon does not reference the fact that the Chinese were legally restricted from becoming naturalized citizens. In the event the viewer does not fully appreciate the implications of this Chinese monster, the remaining third of the screen, clean shaven, non-threatening white boys collect with nothing to do, loitering outside. These are not angry Irish boys. They are victims of the Chinese menace. These young men are well dressed, with jackets and hats and bear pensive expressions – chins resting on their hands. One young man leans on a lamppost with an American Eagle on top, and another leans against the side of the one-man Chinese factory. Without a future, they are, as the caption points out “our boys.” A police officer leads one of the loiterers away to one of three structures in the distance. What path lies in the boy’s future? What fate? Institutions in the distance provide the grim answer, “San Quentin,” “Industrial School,” or “House of Correction.” The message is clear. The Chinese labor problem erodes an opportunity for wholesome, American boys to obtain honest work. They cannot compete with the whirlwind of cheap, Chinese labor. Inside, the Chinese phenomenon could care less. Keller imbues him with a gleeful, sinister expression as he monopolizes and spins profits. The Chinese worker’s face is grotesquely distorted. His eyes are deeply slanted, his crooked smile missing several teeth, digs crevices that form a malevolent expression. His queue rises in mid-air, curled like a whip, propelled by the frenzy of his windmill-like hands. In his contemporary biography of Thomas Nast, Albert Bigelow Paine describes Anson Burlingame, seen seated right behind Columbia, as “one of America’s noblest diplomats” who served the U.S. as Minister to China. In the late 1860s, Burlingame, at the behest of Prince Kung of China, undertook a role as special ambassador charged with the mission to introduce China to other nations of the world. At the conclusion of the Civil War, the United States had its eye on technological and manufacturing advancements and territorial expansion. New York, as a major port city, would soon become an economic and cultural center. As historian John Kuo Wei Tchen explains, the Chinese were forced by the Opium Wars to accept certain international markets, and “sought to gain reciprocal rights for the Chinese in the United States” (168). The result was a diplomatic envoy led by a New England lawyer, Anson Burlingame, who ultimately negotiated the treaty named in his honor, The Burlingame Treaty in 1868. 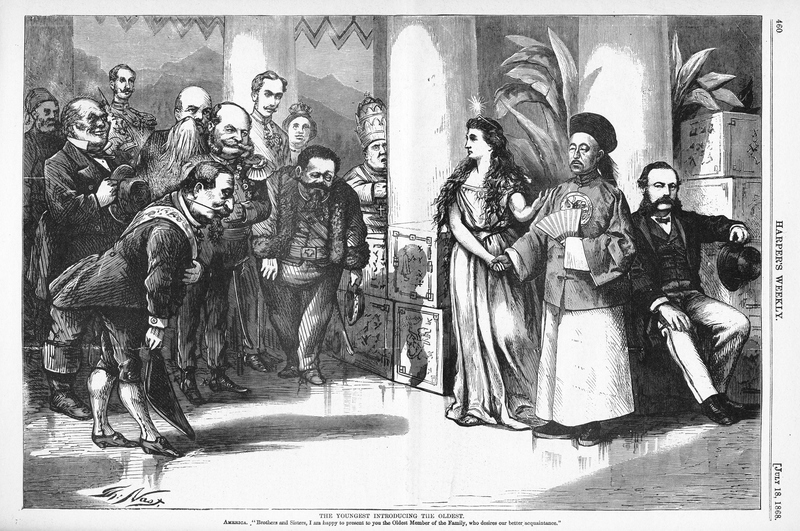 In Nast’s highly detailed wood engraving, Ambassador Anson Burlingame, assumes a modest role, content to allow Columbia to offer the international introductions. A photograph of the meeting served as a resource for Nast’s first depiction of the Chinese diplomat. The diplomat would become prototype for Nast’s symbol of China, as Columbia was for America. “John Chinaman” or “John Confucius” subsequently appears in many future cartoons. In this depiction, he shares the stage and equal ground with Columbia. Columbia extends an affectionate gesture, and touches the Chinese man on the shoulder. 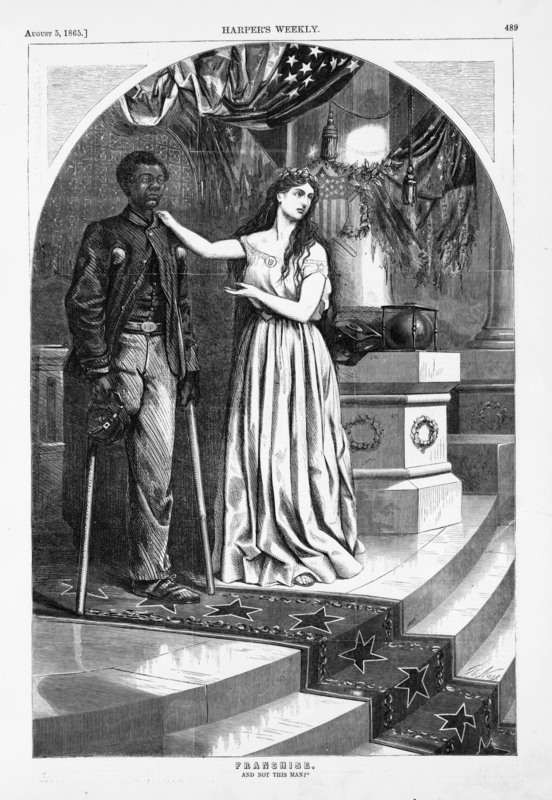 It is reminiscent of her poignant request of the American people during Reconstruction to consider the African American Civil War veteran into the American community – an image Nast drew three years earlier. As a whole, world leaders approach the Chinese guest with respect. But Victoria and Albert, representing Great Britain, stand in the back of the group, on the right and in the shadows. They appear apprehensive. A fearful looking pontiff represents the Vatican. He is shocked by the heathen’s presentation to civilized society. The Pope hides behind a giant column. The “Family” includes other European leaders. In addition to England and the Vatican, Germany, France, Italy, Spain and a representative from the Ottoman Empire, suggested by the Fez, all step up to approach the Chinese diplomat. They extend all due diplomatic courtesies. The Chinese man wears a hat of the Manchu court, a skull cap with a wide, upturned brim and a mandarin-styled tunic with a large crest or seal. In his left hand he carries a partially opened fan. His right hand grips Columbia’s right hand. A star-like halo glimmers atop Columbia’s tiara. She is the enlightened one in the room. Out of respect, almost everyone has removed their head coverings, with the exception of the Catholic pontiff, Queen Victoria and the Ottomon representative at rear, left – all of whom have yet to emerge from the back of the group for a closer look. An Irishman can be seen far right, his top hat placed upon his chest. His smile is pleasant. Everyone else basks in the novelty and significance of the event, albeit with mixed looks of curiosity and anticipation. It is, as our picture in this issue shows, the youngest nation introducing the oldest to the friendship of Christendom. It is, indeed, strange to hear a Yankee speaking for China, and claiming for her that kind of regard and respect which the world has not been accustomed to feel for the old empire. Despite all that we hear and know of its ancient and elaborate civilization, there is still the feeling that it is the most grotesque of barbarous nations, and that there is wholly wanting that plane of common interest and knowledge and sympathy upon which the nations of Christendom are accustomed to meet. The popular image of China is an enormous country surrounded by a high wall, probably with broken bottles strewn along the top, where the people wear their hair in a long tail, squeeze the feet of the women into deformity, cultivate tea, and eat rats and dogs. The world at large has much the same feeling toward China that the genuine cockney John Bull of eighty years ago had toward France. It was a country in which the people spoke a vile lingo that nobody could understand, wore wooden shoes, and ate frogs. This introduction of the Chinese to the world’s civilized nations served as a respectful way to introduce China to Harper’s Weekly’s readers. The magazine attempted to counter some misconceptions and feelings of “otherness” which swirled around American perceptions of Chinese people. 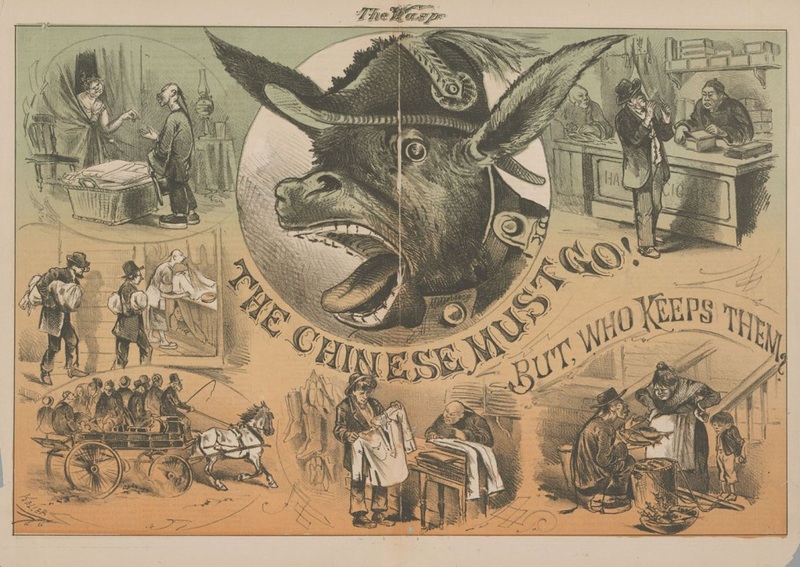 Nast and Harper’s Weekly made an effort to show America that China while different, possessed a history and tradition that afforded China with recognition as “most favored nation” status expressed in the Burlingame Treaty of 1868. 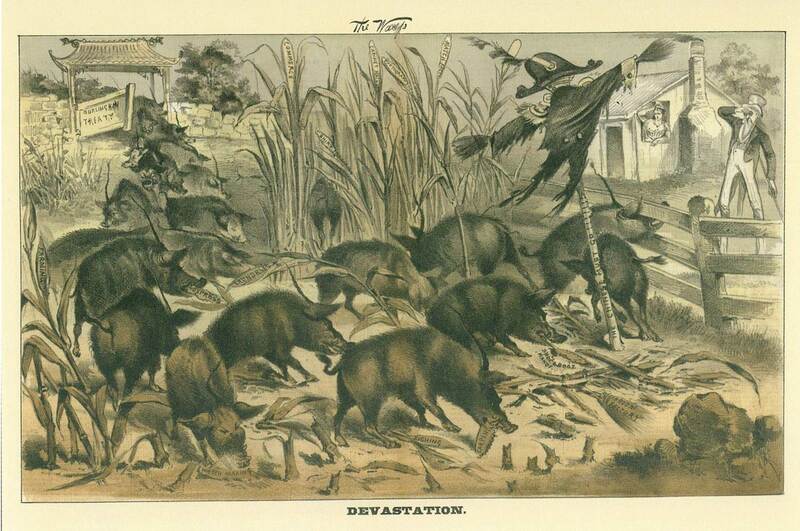 This small cartoon is reminiscent of Nast’s “Here’s a Pretty Mess!” (In Wyoming)”published nine months earlier on September 19, 1885. It is Nast’s last cartoon with a Chinese subject. The back pages of Harper’s typically contained advertisements along with one or two smaller, square-sized areas reserved for cartoons. Blocked out for cartoon insertion, the advertising section was a convenient place to introduce late-breaking news with more detailed reporting following in the next issue. Such was the case with The Chinese Puzzled. This drawing comments the on Chicago’s Haymarket affair, a riot that followed a planned, peaceful labor demonstration to advocate an eight-hour day. Plans went terribly wrong and the gathering turned violent. The incident in Chicago did not involve the Chinese. But Nast uses the opportunity of rioting white laborers to contrast the differences between white and Chinese labor and again focus on the irony of Chinese exclusion laws. Nast prominently includes a fire hydrant on the left side street corner. It is a symbol of municipal progress and rescue. It is not being used to put out the fire or quash the anger of the mob. However, commentary in the following May 22 issue condemns the rioters in Chicago as “mad destructives and assassins.” Harper’s also acknowledged that labor was often left in a position of general disadvantage and referred to another notable labor dispute — striking coal miners in the West — as an example of the failure of production entities and management to fairly negotiate and come to a reasonable and intelligent negotiation regarding the use of a large labor force. By invoking the memory of recent massacre at Rock Springs, Wyoming, Harper’s fingers the real blame of that incident on the capitalistic interests of the railroad and coal mining companies who ignored labor issues in favor of profits. By bringing in Chinese workers as strike breakers, mining and railroad management was implicit in triggering the violence that ensued. On one hand, white labor had successfully pressured ,through strikes, for laws that excluded and restricted Chinese immigration. On the other hand, the Chinese who had remained and relocated were often used as strikebreakers. During this period of an expanding nation, labor demonstrations and strikes, the Knights of Labor served as an iconic organization of American labor. In the 1880s, the KOL stood as the most powerful labor union in the nation (Storti 103). The Knights of Labor were strong proponents of the Chinese Exclusion Act and their membership was predominately Catholic (Catholic University of America). The Knights organized the Chicago Haymarket demonstration. Although the violence which ensued was never planned and did not involve the Chinese, in a spirit of irony, Nast used Chinese figures to lampoon the organizers and remind his readers of the hypocrisy practised by a group with large Irish Catholic membership. After unsuccessful attempts at winning the presidential nomination in 1876 and 1880, James G.Blaine won the Republican nomination for the 1884 presidential elections. 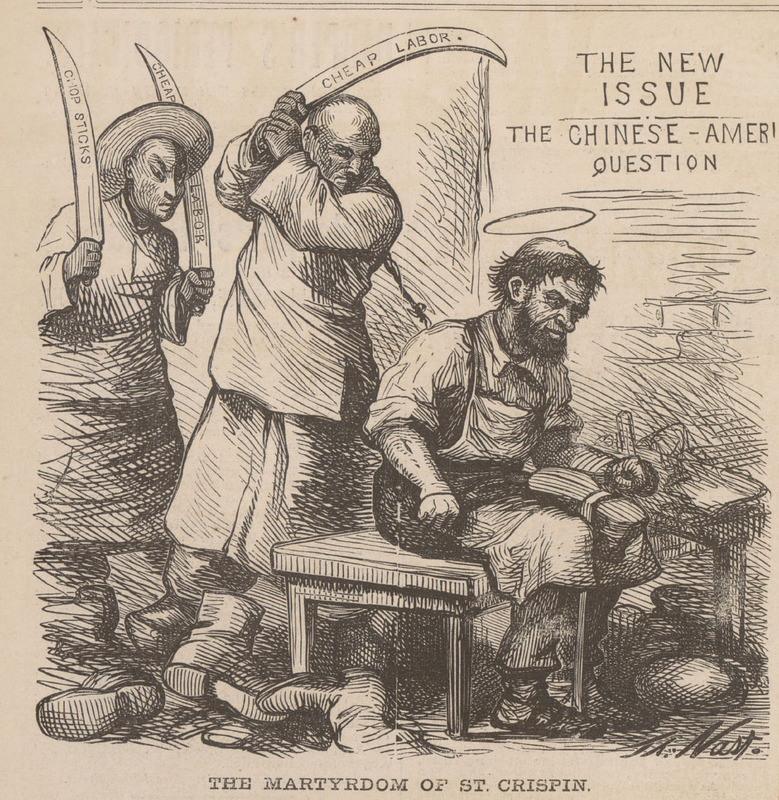 The issue of Chinese Exclusion now decided and enacted into law, Harper’s decided to reprise some of Nast’s anti-Blaine cartoons. Both Thomas Nast and Harper’s editor George W. Curtis could not endorse, nor support Blaine or their beloved Republican party. Nast and Curtis endorsed Democratic presidential candidate Grover Cleveland and became “Mugwumps” former Republicans who went over to the Democratic side for reasons of principle. Cleveland won the election.